Hello blog world, my name is Janelle. I am 30 years old, have been married for nearly 5 years and have two children...boys. My husband is James. He runs our cleaning and restoration company which we started over 4 years ago. I stay home and manage the house and kids. This is new to me, as up until March 23rd of 2008 I was still working out in the world in an office. It has always been my dream to be a stay at home mom, and it has now come true. Our son Xavier is 10 years old, very active, athletic, smart, etc. Our son River is just a few days over 5 months old. He is getting to the fun stage of giggling and discovering new things every day! I find myself sitting and staring at him in awe a LOT. We have a beagle named Chopper, which of course is also Male. I am surrounded. 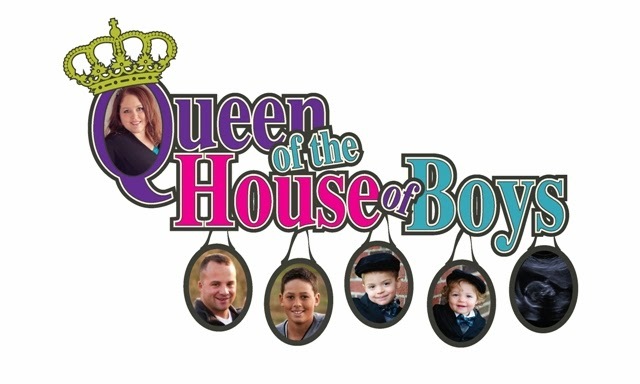 Which is why I chose the blog title: Queen of the House of Boys. There are no Barbies or pink frilly things in my home. I have decorated my home somewhat feminine, yet keeping to neutral tones since is mostly boys. I am longing for an area that I can make my girly castle. My husband is in the midst of turning our garage into a man cave, and I have decided that for now my blog will be my Queens quarters. I enjoy singing and am on the praise band team at my church. Music is my outlet, my release. I am a Christian, and am trying harder each day to become more intimate with my relationship with Jesus. I am not very good at being a disciplined reader of the Bible or studying his word other ways. I am still growing. My Father is a preacher, and as a child I tried hard to bring truth to the "You know what they say about preacher's kids" saying....I think I was very successful in my attempt. I wanted to be accepted and did and said anything that I thought would make that happen. In the end compromising who I REALLY was and wanted to be...to satisfy what I thought would make me well liked. In addition to be a preachers kid (here on out referred to as PK) I was also the youngest of 5 children. When I say youngest I mean by 9 years. So instead of growing up with sisters and brothers it felt like a had a whole lot of aunts and uncles. It wasn't until I was grown and had my own family that I felt like they were siblings. Being the youngest by 9 years meant I was REALLY the baby, and I did get what I wanted, and I was very bossy with other kids, and I had to have things my way...wait, maybe I shouldn't be talking past tense...I may still have some of these tendencies today. I am your first follower! Man I am second!! I kept typing in your name wrong so I had to go get the phone! Love the title by the way....I wish I had a better one and I might change it but when I started I never imagined how much I would enjoy talking to complete strangers so I didn't care about the title. Just be open and honest and the blog world will love you! I do! I can't wait for more! Thank you my bloggy followers! While greatful to have you two as followers, my hope is that you are not the ONLY two followers I have.